In the case of T.G. 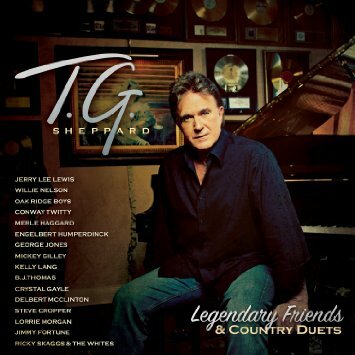 Sheppard - Legendary Friends and Country Duets, it is clear that Sheppard's roster of duet partners actually is comprised of legendary friends. In the past, I noted that when it comes to music, Sheppard has never limited himself to one genre and his refined country sound is a sophisticated marriage of pop and blues with just the right amount of country heart and soul. Well, in this newest album, he proves that once again. Although the title of the album says "country" duets, there are legends from other genres who found a comfortable niche' on this project too. The album kicks off with an uplifting gospel tune when Sheppard joins The Oak Ridge Boys, who were just inducted into the Country Music Hall of Fame, to sing "Down On My Knees". On the very next track he amps the momentum up, and in a different direction, when he partners with one of rock n' rolls greatest legends, Jerry Lee Lewis, to sing "The Killer". Sheppard says this is the only song that was deliberately written for this album and it tells the story of Lewis’ life. The album includes duets with two of the greatest country artists of all time. When Sheppard joins Conway Twitty on "Why Me, Lord", it is utterly splendid. The next song is a witty ditty titled, "It's A Man Thing", which he sings with George Jones. He says it was one of the last songs Jones recorded but it just didn't fit into a project until now. I loved "Songman" with Merle Haggard, and "Dead Girl Walking" with Sheppard's beautiful and talented wife, Kelly Lang, and you could tell Engelbert Humperdinck was clearly right at home singing with Sheppard on a excellent rendition of "Have You Ever Really Loved A Woman". With Willie Nelson, Lorrie Morgan, Mickey Gilley, Delbert McClinton, Steve Cropper, B.J. Thomas, Jimmy Fortune, Crystal Gayle, Ricky Skaggs, and The Whites also contributing to this album, it is certain to be a popular addition to a lot of music libraries. I know I said it before, but I have to say it again, for a plain ol' musical feel-good massage of your spirit, you can't go wrong when you choose any album by the truly legendary T.G. Sheppard. On this project he's taken it to the nth degree by creating a special album that features many of his own musical heroes, mentors, and legendary friends.